Browser-based blackjack: What is it? Playing blackjack for real money on the Internet is easy – you don’t even need to download any special software to do so. We explain what instant-play blackjack is, how it works and the best online casinos to play 21 directly over your Web browser. Browser-based blackjack, otherwise known as instant-play blackjack, is an online game of 21 that can be played directly over your Web browser without having to download any software. Play Blackjack Pro High Limit 21 directly in your Web browser – without need to download. All you need to do is load a reputable online casino like the ones recommended on our site using your standard Web browser (Safari, Chrome, Explorer, Edge, Firefox, etc) just like you would when visiting any other website, and you’ll be playing blackjack within minutes. There’s no tricks, no delays and no data-space requirements – a simple load, click and play format. Thanks to the convenience and fast loading times, instant-play games have become the chosen format for a majority of online casinos, with only a few venues still choosing to offer the option of downloadable software. You’ll find browser-based blackjack available at all top-rated casino sites, suited to all modern Web browsers. The beauty of instant-play blackjack is you can familiarise yourself with an online casino and the games it has on offer before committing yourself to any downloads or sign ups. Blackjack games can be sampled for free, so you can get a feel for a venue before deciding if you like its layout and game catalogue, no harm done. Locate the blackjack category within the game lobby. Scroll through the blackjack variants to choose the game you’re after. Click to load the game instantly over your Web browser. Follow the prompts to place your bets and let the games begin! If you’re playing for real money, any winnings you earn will be credited directly to your online casino account, ready to be withdrawn or used to continue playing. 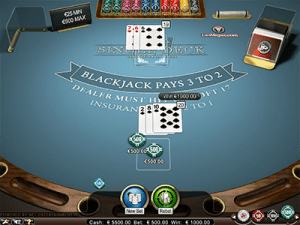 Premium casino games like Live Dealer Blackjack are also available via browser play. Making a web app of your favourite blackjack casino is incredibly easy. Like desktop casinos, many mobile casinos also offer a browser-based format where you can play 21 on the go without having to download an app. A mobile casino will offer fewer blackjack variants than its full desktop site, but you’ll still find a decent handful of the most popular variants to choose from. The browser-based format of mobile blackjack means it doesn’t matter what make or model of smartphone or tablet you’re using. As long as you have a data-enabled device with Wi-Fi, 3G or 4G connectivity, you can play portable blackjack from an iPhone, iPad, Samsung Galaxy, Windows Phone or any other mobile device. 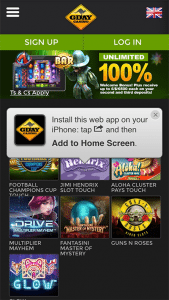 Instant-play mobile sites also give you the option of creating your own Web app – just head to your chosen casino, bring up your in-browser settings and select the ‘add to home screen’ option to create your own customised Web app for one-tap access to your favourite blackjack games. These Web apps work the same as native market apps you download to your phone via the usual methods, like the App Store or Google Play. The difference is they are custom made user apps for your own convience, so you can access your preferred mobile blackjack casino and its software a whole lot faster. Is browser based blackjack safe? As long as online gambling is legal in your country and you’re playing at a reputable and legitimate site, instant-play blackjack is safe and secure. The leading online casinos protect their sites with a minimum of 128 Bit SSL (Secure Socket Layer) digital encryption, which is the same level of online security used by the big banks, where all the personal information you send over your browser is scrambled to prevent it being intercepted by a third party. You can tell if a browser-based blackjack site is protected by having a look in the URL toolbar. The addition of an ‘s’ in the http:// address (‘https://’) means the site uses SSL security, while some URL’s go the extra mile and are highlighted in green or display a small padlock icon. All of the instant-play casinos recommended here at Blackjack.com.au are protected by SSL security and offer a safe and secure place to play real money 21 directly over your Web browser.